George III was king of Great Britain and Ireland from 1760 to 1820. His long reign witnessed the American Revolution, the defeat of Napoleon, the founding of the "second British empire," and the decline of monarchical power. Born on June 4, 1738, in London, George III was the eldest son of Frederick, Prince of Wales. Frederick's death in 1751 left the young George heir apparent to the throne, to which he ascended when his grandfather, George II, died in 1760. As a youth, George was a poor student whose emotional immaturity matched his mental underdevelopment. He formed strong attachments to older men whom he could respect as figures of authority. Abstemious, economical, and morally upright, he worked conscientiously, though unimaginatively, at being king, at preserving the Crown's dignity, and at maintaining England's power and honor. He knew the constitutional limits of monarchical power and had no wish to exceed them. With experience he grew adept at using all the Crown's considerable political influence, supporting one faction against another and employing "secret service money." Indeed, his skill at these activities lent color to Opposition cries that he exercised "personal rule" and "subverted" the English constitution. One of the first matters to occupy the new king's attention was his own marriage. Suppressing his preference for an English woman, George chose, as was expected of him, a German Protestant princess, Charlotte Sophia of Mecklenburg-Strelitz. Although she was homely and dull, George remained faithful to her after their marriage in 1761, and they had 15 children. Early in his reign George made himself unpopular by ousting William Pitt the Elder (1761) and installing in the Treasury his adviser, Lord Bute. As a Scot, Bute was despised and distrusted by the English even before he made an unpopular peace with France. George relied utterly upon Bute, but his confidence was misplaced, for Bute had neither sagacity nor courage and soon resigned (1763). (and increasingly unsuccessful) North at the head of the government for 12 years. Several explosive issues buffeted George and his government during the first 2 decades of his reign. Most significant were the turbulences created by the political reformer John Wilkes and by the American colonies. The pious King regarded the disreputable Wilkes with horror and hatred. By prosecuting the popular Wilkes, George further increased both his personal unpopularity and the public's lack of confidence in his government. But the exercise of power depended not on mob approval but on the favor of the gentry in the House of Commons. As the American war dragged on, the government's lack of success together with the haranguing of the Opposition alienated many of the gentry who had formerly voted for the King's policies. Furthermore, large segments of influential public opinion outside Parliament disapproved of the American war and of government policy and wished for administrative reform and economy. North's ministry fell in 1782, and the American colonies won their independence. These two events ushered in a new phase in British government and in the life of George III. Once more George had to tolerate ministries headed by persons whom he detested: first Rockingham, until his death in 1782 brought Lord Shelburne to power, and then the "infamous" Fox-North coalition nominally headed by the Duke of Portland. By exceeding the strict bounds of his constitutional authority, George managed to bring down the coalition over the issue of Fox's East India Bill. To head the new ministry, he picked William Pitt the Younger. Pitt was strong and capable, and his long tenure of office was markedly successful. His strength rebuffed, just as North's weakness had invited, the King's political maneuvering. While Pitt devoted himself to financial and administrative reforms and then to the struggle with France, George III retired more and more from political life into domestic concerns. He still had occasional political impact, most notably when by his adamant opposition to Catholic emancipation in Ireland he caused Pitt's resignation (1801). His domestic tranquility was disturbed by the coarse extravagances of his two eldest sons (George, Prince of Wales, and Frederick, Duke of York) and by his own ill health. George III experienced mental incapacity on a number of occasions. His mental aberration, long deemed manic-depressive insanity, has recently been diagnosed by medical experts as the result of a rare metabolic disorder called porphyria. George had four major attacks: October 1788 to February 1789; February-March 1801; January-March 1804; and October 1810 to his death on Jan. 29, 1820. The last illness led to the establishment of Prince George's regency (February 1811). In his last years George III was also totally blind and deaf, a proper object of sympathy, even affection, for the public who despised the Regent's profligacy. 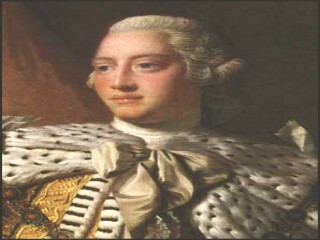 View the full website biography of George III Of The United Kingdom.